Girls need female role models and mentors to help shape them into women of worth. 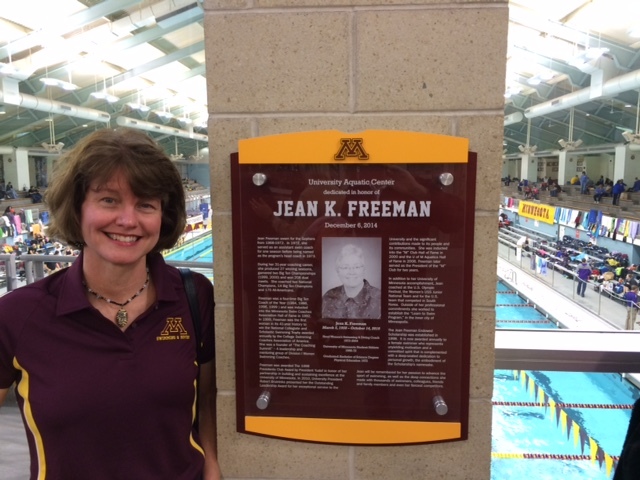 Specifically, I want to recall one such woman, Jean Freeman, my former swimming coach at the University of Minnesota. Jean had a profound impact on me as an athlete and more importantly as an emerging female leader. Prior to my coming to the U of M, my swimming coaches were always men. I have nothing against men, who were very formative in my athletic development and mental preparedness. But it wasn’t until I was coached by Jean as a golden gopher that I felt nurtured in a way that has had a life-long impact; the type of real time learning about being a female leader navigating amidst a world full of male leaders. Jean was a quiet, yet forceful type of female leader. Her way of encouraging could be found through her piercing whistle, poolside chats and questioning of my sometimes playful attitude towards training (or off season antics). She carefully assigned me leadership “tests” throughout my years at Minnesota to encourage my steady progress. These ranged from hosting potential swimming recruits, to representing the “U” at functions and leading my peers as a captain. Her nature was to encourage and to strengthen my resolve to want to be better – as a swimmer and as a person. Her lasting touch of influence stays with me today. 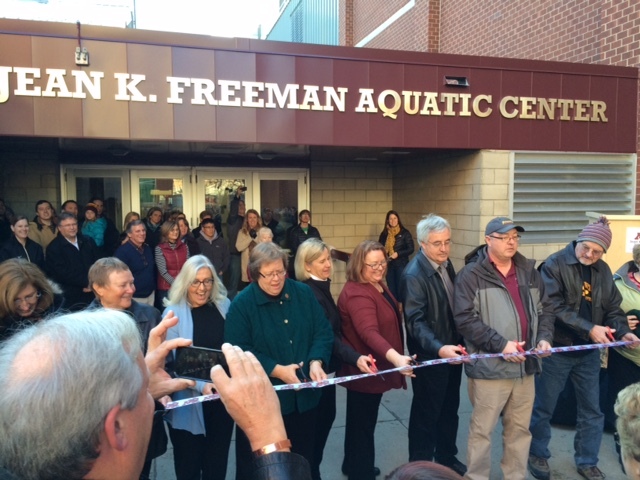 As I stood at the dedication of the Jean K. Freeman Aquatics on December 6, 2014, I could imagine Jean would be blushing, humbled by all the attention. She was not one to revel in the spotlight, but one to want to push others to get there. Jean, you are most deserving of this lifetime achievement award of having a building named after you. Not because you or your family or swimmers gave millions of dollars to “buy” this for you (for we did not), but because of the legacy of a life well lived and a statement of the power of being a female mentor to thousands. I am proud of the University of Minnesota for naming a building after a person of worth, rather than the worth of a person. I am so proud of you, Jean. Of what you built at Minnesota and of the mentor you were to me and hundreds of others. Your goodness is having a ripple effect to other young women and will continue to do so as a living testimony of your life well led. I look forward to future visits to campus to again see the “house that Jean built” and also to remember the lessons you taught me and so many others. Though you lost your battle to cancer, you won our hearts and your lessons live on in all who knew you. 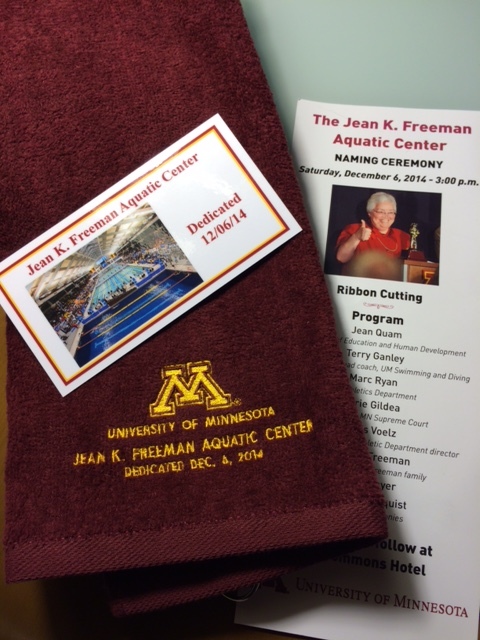 Welcome to the Jean K. Freeman Aquatic Center, home of my mentor, Jean Freeman.